The pillars of an abusive governance regime are crumbling all around us, bringing both dangerous wreckage in lost jobs, but maybe hope too. Pressure to renegotiate or potentially bring PFI in-house is building. This is evident in the prolific collapse of construction giant Carillion. The tectonic ripples of multiple Carillion scandals reveal both unethical practices of corporations and their closeness to a state that has shed itself of its social functions. The UK Government also demonstrated a lack of oversight, failing to implement their ‘Strategic Risk Management Policy’, when profit warnings seem like they had little effect on the government response. The massive HS2 contract being given to Carillion after this risk was known (https://www.newstatesman.com/politics/staggers/2018/01/carillion-issued-3-profit-warnings-so-why-was-it-still-getting-government). A Crown Representative, who is supposed to manage the relationship between high-risk contractors and government had not yet been appointed even after three profit warnings and months of notice. All of this points to the problems of a market state and a massive swindle that has taken place across public service delivery. PFIs and government outsourcing were sold to the public on the basis of cost-savings. We are less than a generation on from then and have a legacy of debts to tax-avoiding firms, no oversight or accountability. These problems are mirrored in the outsourcing sector case, where companies have even been found to be breeching anti-discrimination legislation, in ATOS and CAPITA’s handling of Personal Independence Payment assessments (https://www.theguardian.com/society/2018/jan/29/government-to-review-16m-disability-benefit-claims-after-u-turn). For two-decades, outsourcing and PFIs were mainstream. They have been a key part of the new bargain between the state and the market. This situation meant that governments and councils of all forms allowed tax-avoiding structures to take part in the building of high-interest, to-rent schools and hospitals through PFI deals. For instance, research by The Herald found that new East Dunbartonshire schools, built under a PFI, are 50% owned by Innisfree Group Ltd., whose largest shareholders base themselves in Jersey for what seem to be tax reasons (https://leftfootforward.org/2017/06/a-labour-government-would-end-the-pfi-tax-avoidance-racket/). This is quite a typical example of over £307bn still to be paid off over the next 25-30 years of PFI deals in the UK, much of this profiteering destined for financial secrecy jurisdictions. It would be fab if proven failure was enough to root out abusive corporations from public works. However, from the progressive London Boroughs of Haringey and Lambeth, to the city councils like Glasgow and Manchester, local government continues to be in thrall of the private sector. We can see this most clearly in profit-making arms-length organisations. The unimaginable horror of Grenfell tower has not led a swathe of councils to bring their social housing back in-house. We need a social alternative. Now, these ideas can seem unbelievably dense and technical. And yes, this is only amplified by neoliberal reforms that blur the responsibilities of councils with arms-length bodies. However, taking action on local issues is a crucial part of building a better world. 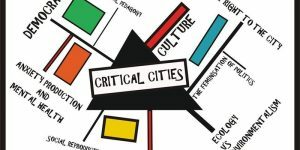 As the Critical City project is launched In Glasgow, we are looking for ideas. One idea is for local activists to advocate is making procurement a tax justice issue. It is no secret that companies, as well as wealthy individuals have been exploiting tax loopholes. Some even go as far as setting up secretive Trusts which mean its impossible to tell who benefits financially from any business shenanigans. This mass exodus of élite coin to secrecy checkpoints comes at exactly the same time as public sector pay caps, benefit sanctions and cuts to vital social services. A loss of oversight and institutional pro-corporate bias has allowed a severe drought to occur on what were always sluggish streams of trickle-down wealth. Now, it turns out that there is a way to take the reigns of the procurement process to select for companies that are not contributing to this Monopoly-man capitalism. Why not try it? Councils already have a way to do this – Community Benefit Clauses (CBCs). CBCs within procurement are there to allow the council to attain some wider social benefit when contracting out services. Glasgow City Council currently makes mandatory requirements of outside contractors. One CBC prioritises recruitment of staff from those from disadvantaged backgrounds. Outside companies have to evidence that they are doing this. The achievements of community benefits (or lack of) is also reviewed on at least a quarterly basis by the Community Benefits Steering Group at the council. So why not have a new tax justice Community Benefit Clause? This would be an easy, progressive win. Now, I anticipate the question, it’s a big one, how do we define fair play and a tax justice standard? For this, we do not need to perform any fresh ideological soul searching, as there is already a nationally recognised benchmark, called the Fair Tax Mark. This is a certification that companies apply for which gives an independent assessment of corporate accounts and financial arrangements. This means that companies must be paying the correct amount of UK corporation tax according to profits gained in this country. This is about accountability in accounting and bringing the companies squarely within the confines of democratic decision making. It doesn’t seem like there is any reason why governments who set corporate tax rates at a set rate should regularly be accepting tiny amounts. This might seem like a small issue, but it takes you right to the heart of the neoliberal project. Secrecy, double standards for the wealthy and quietly narrowing the locus of democratic, collective input is a state of affairs all too familiar in Britain. But even in this individualistic, corporate world, councils and public health trusts are customers in some of the juiciest deals available to corporations. Having a strong Community Benefit Clause about tax justice in Glasgow is a way to bargain upwards, for the common good. We hope it could create a cascade of similar changes to Procurement across UK councils. Councils are already asking some tough tax questions of contractors (http://www.taxresearch.org.uk/Blog/2016/11/21/councils-are-increasing-the-pressure-on-tax-dodging-companies/). It seems like councils will like this too- the Fair Tax Mark is an existing benchmark. We aren’t asking for long, complex tax investigations by the council. Politicians of all stripes in the UK are now dealing with a population who know that these decisions are about political choice. In the miserable reality of groundhog-day austerity, a Fair Tax Certificate for procurement should be a test for all of those in public office. Do you work for the people in all their diversity or for reinforcing the bolt holes of capital? This is one small example of making neoliberal policy toxic. It has the bonus of also signposting the way to a positive progressive alternative at the same time. I’m going to propose this at The Critical City Convention, taking place in Glasgow on February 17. We are getting together to talk about how we can co-create a radical municipalist movement. Would love to see you there. Agree with your point that we live in a ‘market state’. This is the barrier to the kind of fair tax proposal you put forward. That’s why I think we have to develop ideas for an alternative, democratic, non-market state. You characterise Lambeth and Haringey as ‘progressive’ councils in thrall to the developers. Unfortunately, they are far from progressive! Both are currently run by the right-wing Progress faction of the Labour Party and are actually in bed with the developers, snuggling up in indescribable ways. Both councils have set about demolishing perfectly good council estates and been reprimanded by Jeremy Corbyn. Haringey’s leader has just quit under pressure from Momentum over the issue of gentrification. It’s not much different in Croydon, south London. The Croydon Assembly, which has met twice yearly since 2015, has published its own alternative manifesto for the upcoming council elections. This is the result of a lot of work by Assembly working groups. Here’s a link to it. hi Paul. Sorry this reply to your excellent point has taken so long. I would totally agree with you actually. When I say ‘progressive’ I mean that Lambeth and Haringey residents vote left and for the most progressive party available to them, yet they still are treated in this way. With what we have seen come out of these councils, I think you are totally right about this, they aren’t progressive in the slightest. I would like this to be a proposal, and I think that it could work in some areas, but I am glad that we can also have a conversation about the role of the state and the pro-corporate function it now fulfills. I think Chris Hedges is doing a lot of work on this idea right now in a US context. This goes far beyond any one political party and it has been hegemonic within Labour and Tories for decades. Thankfully we are now seeing a challenge to this in many places- from communities and within the Labour party too. I found the Croydon Assembly alternative manifesto fascinating, so thanks for sharing that with me.